Most of my clients are away for the holidays/New Year, so it is a very slow time of year for me. I am not complaining and am actually embracing the time I have for myself. I will be able to blog, work out class formats, make videos, and COOK! I will say it. I am NOT a good cook. I try, I experiment, but I am really not that great. My mom and dad are both great cooks, and both my parents agree that my mom used to stink. So, I still have a chance. My camera man is very critical of everything I make. Rarely does he say something is "GREAT". So when he says something is good, I know he means it. He always jokes that he is going to send me to cooking school. He says it so much that I am starting to think he is serious. I woke up early this morning with a craving for pancakes. I remembered a friend/student of mine talking about Carrots 'N' Cake Pumpkin Protein Pancakes, and how she loved them! Tina, from Carrots 'N' Cake took my ZUMBA class at Equinox a little while back. TIna was so sweet and down to earth, I loved having her in class. 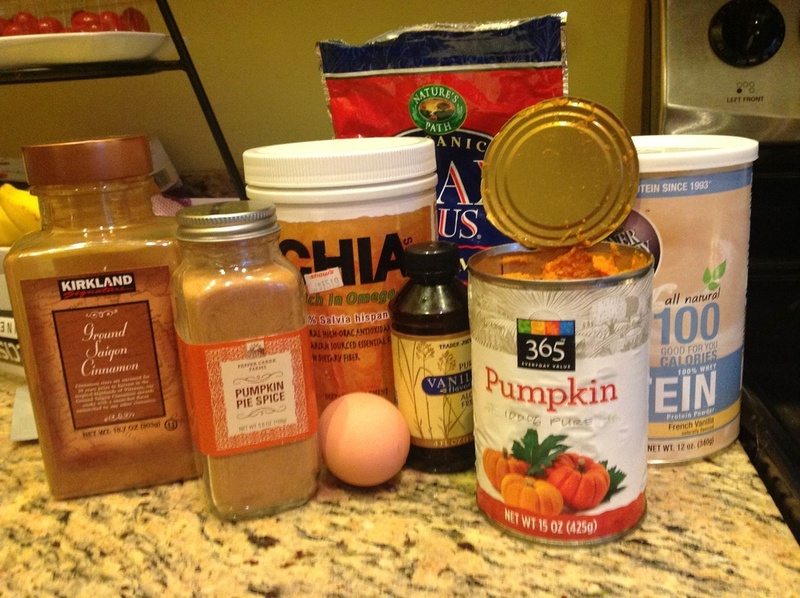 I searched her blog this morning for the famous "Pumpkin Protein Pancakes (Wicked Good)" recipe. I was nervous I was not going to have all the ingredients since I definitely need to do some major food shopping. Look here at Carrots 'N' Cake blog for the recipe. I changed a couple of things. I did not have nutmeg so I added a tiny bit of vanilla extract and some pumpkin pie spice. I also added a tablespoon of chia seeds into the mix. My first attempt was a fail. I think my pan was too hot and I flipped too early. It was stuck to the pan and fell apart. My second attempt was a success. It flipped easily and looked great. And the taste you ask? Delicious! I was surprised by these amazing little pancakes. They are "wicked good"! Do you have a quick and easy homemade pancake recipe? Posted on December 19, 2012 by Brandon Bettencourt and filed under food, breakfast, sweet and tagged cooking food pancakes pumpkin breakfast banana sweet. 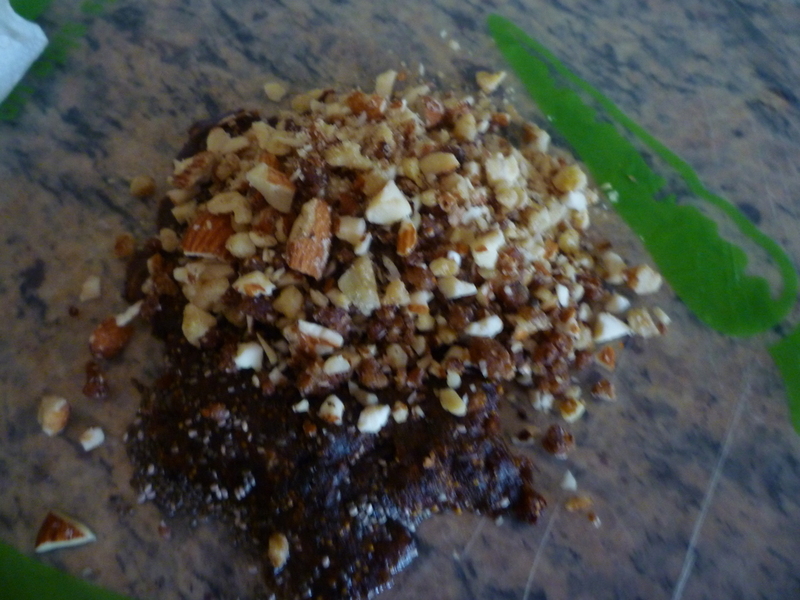 In a blender (I used a mini food processor by Proctor Silex) throw in all the nuts. Make sure not to turn the nuts into a powder. You want to have some chunks in there to add texture to your bar. Set the nuts aside. I used a vegetable cutting board and laid out my dried fruit paste. I took the chia seeds and added it to the top. After mixing the chia seeds and paste by hand, I threw in my nuts. Mix nuts and paste together. I always loved playing with my food. You can make a mohawk if you would like. Divide mixture into 8 snack balls. Throw the balls in a plastic bag and store in your fridge. Each ball will contain a little over 100 calories (~108) and provide you with a sweet and nutritious filled snack that will give you your afternoon boost, or that pre workout lift. You can get creative with the mixtures and add different dried fruit for the paste, or nuts for the filler. Let me know if you try it, and how it comes out! Did you add something different? Posted on October 12, 2011 by Brandon Bettencourt and filed under food, sweet, snack, dessert and tagged snack nuts healthy dates 100 calories homemade. Preheat oven to 350 degrees F. Lightly grease muffin pans. In a large bowl, mix the whole wheat flour, brown sugar, cinnamon, baking powder and baking soda. In a separate bowl, mix the bananas, egg whites, vanilla extract and milk. Bake 16-18 minutes in the preheated oven, or until a toothpick inserted in the center of a muffin comes out clean. Posted on July 20, 2011 by Brandon Bettencourt and filed under food, snack, sweet, dessert and tagged muffins whole wheat blueberry breakfast snack dessert.